Been back to the Townhouse this morning to see the watches in daylight. It’s revised my opinion somewhat. I liked the Arrow but after trying it on this morning i’m smitten. It looks really good on the wrist. The MBIII is a winner as well but only on the leather strap. On the bracelet I’m still not keen. There is a ‘BUT’, I really don’t like the engraving of the ejector seat on the back. It may be due to it being a prototype but the engraving looks cluttered and really just a black mess. In darker light it just looks like something has been stuck to it. Hopefully they’ll neaten that up for production. A special message from Nick English at the London Townhouse event, directed to our Alt1tude membership! Thanks for posting Nicks video Jeremy. Nice touch indeed. 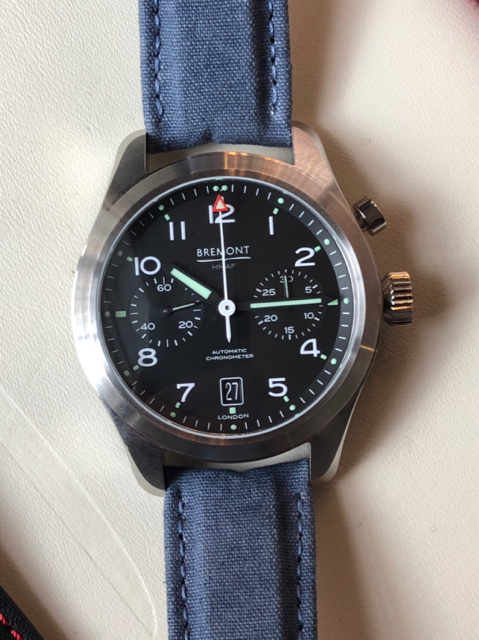 A lovely touch from Nick - and Bremont. Anyone from the forum who is going along this week, please share some pictures. I was glad to be finally able to get to the townhouse event this year. We had a nice wander round and chat to both Nick and Giles and also Ken from the New York boutique who remembered us from 2 years ago! I do quite like the military range, also the MB111 I really like the engraving on the back. For me though I like the S2000 I liked the yellow but now I think I prefer the red! 1. The broad arrow denotes military property. It’s ilegal to put it on anything that hasn’t been property of the MOD. CWC watches have it on there watches as they are army issue watches and any that have been sold at one point belonged to the MOD. You can buy surplus CWC watches as a civilian but not the latest models. The 1918 could potentially have it due to the fact the watch contains plane parts that once belonged to the MOD. I have a heuer Monte Carlo stop watch from my dads RAF Jag and that has the 6B marking and the broad arrow on the side of the case.